NOTE - We have detected that you are browsing our site from the USA. PartyPoker.com does NOT accept poker players located in the USA. To play online poker, please view our list of the best USA poker sites. Party Poker doesn't accept USA players, but the site is one of the premier online poker rooms for non-Americans. Party offers smooth software, massive player traffic, and easy to beat competition. Plus, if you sign up at the Party poker room with bonus code 500PS, you will automatically receive a 100% up to $500 bonus on your first deposit at the poker room. Continue reading our full Party Poker review for details. Party Gaming, the company that owns Party Poker, is a publicly traded company on the London Stock Exchange and is one of the most trusted gaming companies in the world. Thanks to its large player base, Party Poker has thousands of players logged in around the clock and offers a wide variety of poker tables at all stakes. All new players who sign up with the bonus code 500PS qualify for a 100% deposit bonus up to $500. This special bonus code gets players a much bigger bonus than the standard $100 bonus offered at the Party Poker website. All you have to do is sign up, enter your bonus code and make a deposit. Party Poker will double your first deposit and give you up to $500 extra. The Party Poker bonus is cleared by earning PartyPoints in real money ring games and tournaments. PartyPoints are issued in ring games at a rate of 2 PartyPoints per $1.00 paid in rake. Tournament players receive 2 PartyPoints per $1.00 paid in tournament entry fees. For example, a $30+$3 tournament would pay 6 PartyPoints to each participant. The number of PartyPoints required to clear the bonus depends on the currency used to deposit. Players who deposit with US or Canadian Dollars must earn six times the bonus amount in PartyPoints. Players who deposit with Euros must earn eight times the bonus amount and players who deposit in Sterling must earn nine times the bonus amount in PartyPoints. The Party Poker lobby is definitely above average thanks to an intuitive table listings interface that allows for sorting and custom table filters. Table stats such as the average number of hands per hour, the average pot size and the number of players seeing the flop make it easy to spot soft tables and avoid tight tables. 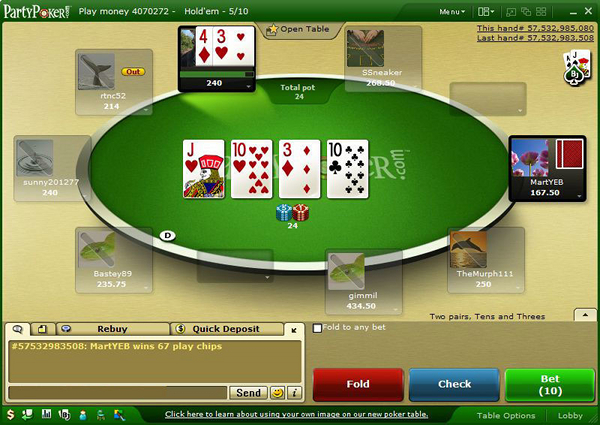 An instant play option allows players to access the Party Poker software through their web browsers without downloading anything. This feature is useful for Mac users and players on the go. The no-download software looks just like the normal software except it opens each table in a separate browser window. Party Poker is the clear leader in tournament offerings for non-US poker sites. Players can participate in tournaments that range in buyin from absolutely nothing to more than $600 a pop. More than $100,000 is given away every month in freeroll tournaments and considerably more is offered in Party Poker’s list of guaranteed prize pool tournaments. Two of the most popular tournaments are the weekly $300,000 Guarantee and the Monthly Million guarantee. In addition to normal freezeout tournaments, Party Poker also offers turbos, bounties, shootouts and heads-up tournaments. Satellite tournaments run on a regular basis and send players to events such as the WSOP, complete with travel accommodations and spending money. The sheer number of tournament options is one of the best in the industry and will not disappoint any tournament enthusiast. Party also offers a wide range of sit-n-go tournaments at all buyin levels. Step tournaments are incredibly popular and can award players considerable cash prizes for a minimal up front investment. Traditional sit-n-gos also run around the clock and start out at just $6. Party Poker is one of the busiest online poker rooms out there. Despite closing to US players several years ago, Party has a huge player base and plenty of traffic. The poker room is the busiest during peak European hours but thousands of players can be found online around the clock. The competition at Party Poker is softer than average at all stakes. The high stakes games are still fairly difficult but the games get soft very quickly as you step down in stakes. Television advertising attracts tons of casual players and keeps the player pool teeming with fish. Most withdrawals are processed back through the method used to deposit. Players may also elect to receive paper checks in the mail or use wire transfers for large withdrawal amounts. Cashouts are processed quickly so waiting time between playing with your money and holding your money is minimal. Customer support is available 24 hours a day, 7 days week via phone and e-mail. Party Poker offers toll free numbers in the majority of the countries it serves plus an international toll number for the rest of the world. This is one of the few large poker sites that offers phone support for all its players. Ready to Play? Visit Party Poker to Get Started Now! Now that you know everything about PartyPoker.com, it's time to get started. Sign up at Party Poker with bonus code 500PS to automatically receive our exclusive 100% up to $500 sign up bonus.